Posted: Tuesday, March 1, 2016. 9:52 am CST. 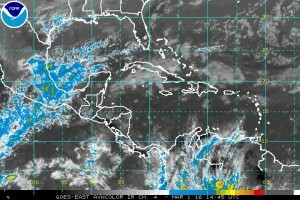 By BBN Staff: Mainly fair weather is expected over the next 24 hours or so followed by a slight increase in moisture. 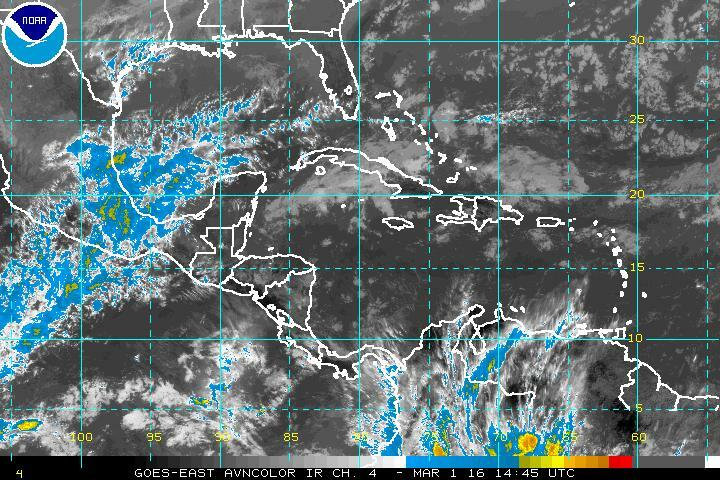 The National Meteorological Service of Belize is predicting mostly sunny skies today and partly cloudy skies tonight with only isolated showers. Winds will be blowing from the East-Northeast at 5-15 knots and the sea state will be light chop-choppy. High temperatures today are expected around 83 degrees Fahrenheit along the coast; 88 degrees Fahrenheit inland and a comfortable 76 degrees Fahrenheit up at the exposed areas of the Mountain Pine Ridge and along the Maya Mountains in the south. A high tide is expected this afternoon at 2:51 and a low tide tonight at 10:43. The sun will set at 5:59 this evening. The extended forecast into tomorrow night calls for some cloudy spells with a few showers affecting most areas of the country.